Google is making changes again! (Imagine that!) 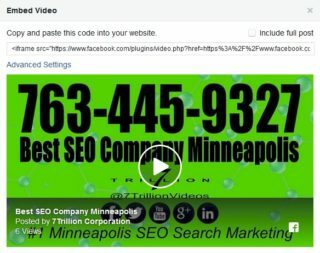 Maybe… Just maybe… it’s time to start embedding Facebook videos into your WordPress site rather than embedding YouTube videos? Here are the Google changes to YouTube for 2018. 1. YouTube videos no longer auto-play on websites! 2. YouTube will put your icon and title on the video by default with no opportunity to turn it off. 3. They are also removing the ability to turn off related videos on embedded videos. WHAT? I know, I know, many of you DO NOT like videos to autoplay upon opening a page on a Website. So many have complained, probably because they are surfing the web at work and come upon an autoplay video and OOPS! “I forgot to turn off my sound and now my boss heard me playing a video.” (my bad) However, the one that bothers me the most out of all of these is #3. The very LAST thing I want on my website is Google/YouTube deciding what I want to view next and popping up some “related” but actually totally unrelated video on my website. Sorry YouTube I DO NOT want related videos at the end, I want my custom thumbnail to show! Glad you asked! Actually there are TWO answers. One is use a plugin for a YouTube video player which will turn off suggested videos after each video plays. The second is, embed the video from Facebook! BOOM! Shoot yourself in the foot Google! Facebook wants to be YouTube so game on! There ARE other options!!! So how do we embed Facebook Videos into a WordPress page or Post? First find the video you want to embed. Look for the three dots in the upper right. Click those dots! A drop down menu will appear, look for “embed”. After you click “embed” you will see the complete iFrame URL, (see image below) copy and paste that URL into your page! BOOM! Video plays from Facebook and DOES NOT show related videos at the end of the video. Here is a sample of a video embedded from Facebook! Oh yeah! Crank up the volume!